Concrete is among the most durable construction materials on the planet. It is quite literally a densely packed layer of an assortment of incredibly strong ingredients that all add up to become one amazingly strong slab of toughness. That’s why concrete driveways are such a popular option for houses. However, even the strong can come apart at times. Reasons for concrete cracking can vary. However, an inferior pour is often the primary cause of cracking—if the pour isn’t done perfectly, the effects can show up years later. Other causes could include concrete that is not thick enough to handle the type of load that your driveway is forced to bear. Obviously, if you’re parking a semi-trailer in your driveway every night, you’re going to need thicker concrete than if you’ve got a couple of Corollas and a scooter. 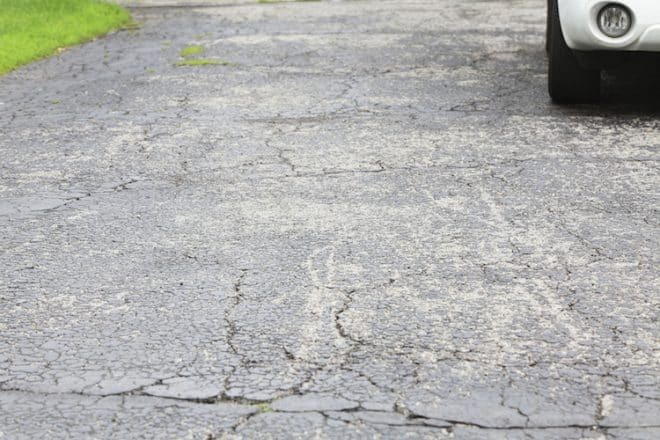 What makes a concrete driveway so amazing is that even if it does start to crack, that doesn’t necessarily mean you have to hire a bobcat and tear the whole thing up. In fact, concrete repairs are relatively easy to execute. The team at Everlast Services has been carrying out driveway repairs for over 20 years, so here is our ultimate guide on the subject. Prepare the surface: From the pour to the repair, the key to concreting is preparation. The first thing you need to do to ready your driveway for repair is to give it a good clean. A pressure cleaner is the best way to do this. Make sure you pay special attention to the cracks because a clean area will give the new concrete the best chance of curing and hardening. Fill the cracks: If the cracks are relatively small, you can use masonry filler such as a concrete sealer or pourable grout. Use gloves and a trowel and make sure the crack is filled completely. If you’re working with bigger cracks, use a cement compound and with either your hands or a machine pour the compound in the crack and make sure it is filled completely. Take care to get the consistency of the filler right—it should be nice and thick, and not too watery. Let the filler dry: Leave the driveway overnight to allow for the filler to dry and bond with the surrounding concrete. Make sure not to drive, walk or place any weight on the driveway. Clean the surface: Once the fillers have dried completely, give the driveway another hose down with a pressure cleaner. Don’t spray the cracked areas too hard or you could unsettle the filler. If after a light spray you notice any displacement in the filler it means the mixture hasn’t settled and you need to give it more time. Apply the new concrete: Next mix up some concrete, using a little more water than normal to prevent it from drying too fast. Then use a rubber scraper to smooth the new cement over the entirety of the driveway, taking your time to ensure uniformity in the final set. The best way to achieve this is to work in small areas, making one area look perfect before moving onto the next. If your driveway had any texturing, you can add this texturing at this point. Texturing is also a great way to prevent the surface from becoming slippery when wet and could save a lot of nasty falls during that mad dash to get out of the rain. Seal the driveway: Finally, seal the driveway and keep an eye on it to see if any small cracks begin to appear. It’s always better to fill up small cracks to prevent them from spreading and making the job bigger than it needs to be. Of course, if you enlist the expertise of Everlast Services for your concrete driveway you wont need to worry about repairing any cracks for decades or even the lifetime of your driveway. Everlast Services will be more than happy to come out and fix up any major or minor repairs you need and pass on even more tips for keeping your concrete strong, sturdy and crack-free. All you have to do is Contact Everlast Services today. We offer services in all types; from stamped to exposed aggregate – so you can be sure that we will have a solution to your every need and query.